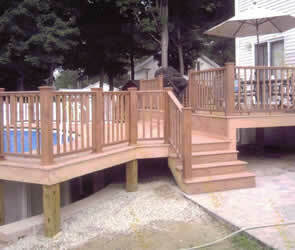 With a deck, as in a house, the foundation, provides the structure with its overall integrity. 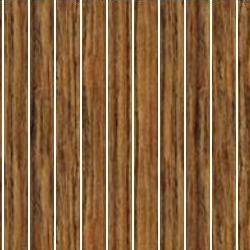 It provides protection from settling, shifting and wind uplift. Figure 1 shows a deck sitting on 6 x 6 pressure treated posts. The foundation must be designed to distribute the weight of the deck and everything on the deck to the ground. While most house foundations comprise a masonry wall around the entire perimeter of the structure, deck foundations usually consist of a series of individual concrete piers and footings. This is the same method used to build high-buildings. 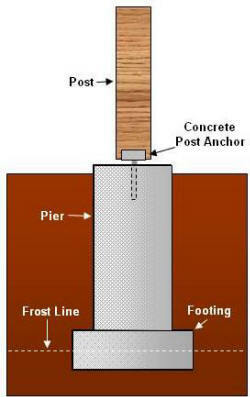 Wood post on a solid concrete pier and footing, as shown in Figure 2. 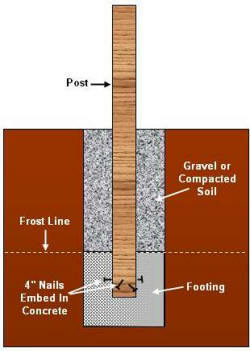 Post embedded in a concrete footing, as shown in Figure 3. 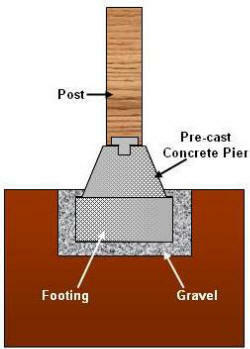 Post on pre-cast concrete pier and footing, as shown in Figure 4. Building codes govern the minimum size, spacing and the depth of foundation supports. A typical code calls for a 16 inch square or 18 inch diameter footings that are 8 inches thick. To calculate how much concrete you may need download our free concrete calculator. In cold climates, codes also require that the bottom of the footing be below the frost line. If footings do not extend to this depth, ice can form beneath the footing, pushing the deck up with enough force to weaken the entire structure, a situation called "frost heave". From an engineer's perspective there are two kinds of weight, or deck load. Dead Load - the weight of the structure itself, along with all of its components, such as railings, overheads and built-in benches. Live Load - this consists of variable factors such as people, furniture, and snow. A typical code requirement for decks is that they be able to support a dead load of 10 pounds per square foot and a live load of 40 pounds per square foot for a total of 50 pound per square foot loading. These load requirements apply to decks that will be used in normal conditions and are built on undisturbed soil. If you want to include any particularly heavy features on your deck, such as a spa or large planter, or if the soil is loose or composed of a lot of clay you may wish to increase the per square foot loading of the deck. In all cases you should discuss the exact requirements for foundations in your area with your local building department.